Posted on February 8, 2019 by Elissa L.
After temperature extremes in January as low as minus 17 windchill, Broadmoor is having a brief thaw. Trails are mostly free of ice and ponds have some open water. These are perfect conditions to look for river otters. Otters swim up and down the Charles River and streams that flow into it. At Broadmoor, Indian Brook flows through the sanctuary. Otters swim upstream, rest on floating ice; then slide into the water looking for fish. They are curious creatures so you may see them dive into the water, then raise their heads like a periscope to see what you are up to. 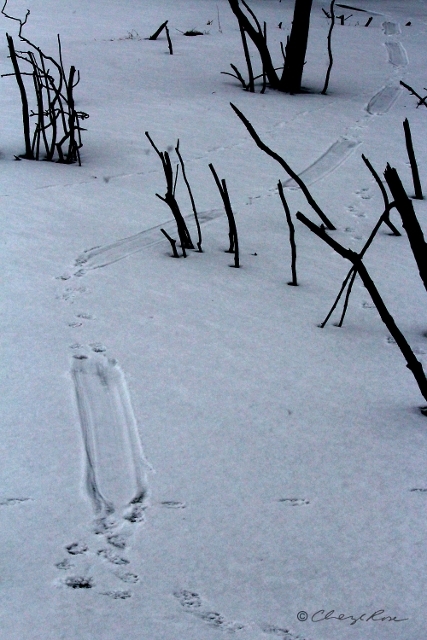 If you don’t see the otters themselves, look for slides in the ice or across snow. 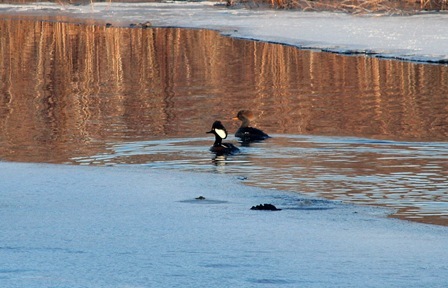 Another animal that visits when there is even a little open water is the hooded merganser, a petite diving duck, also looking for small fish. This pair of “hoodies” as some call them, are fishing together in the Wildlife Pond. This entry was posted in news on February 8, 2019 by Elissa L..